Der Artikel Johann Sebastian Bach (1685-1750): Transkriptionen für Klavier Vol.9 wurde in den Warenkorb gelegt. 1931 lud die charismatische Pianistin Harriet Cohen alle mit ihr befreundeten Komponisten ein, Arrangements von Bachwerken zu schreiben. Am 17. Oktober 1932 spielte sie die Uraufführung ihres »Bach Book« in der Londoner Queen’s Hall. Jonathan Plowright spielt die illustre Ansammlung in der 9. Folge der Bach-Transkriptionen. In 1931 the pianist and muse Harriet Cohen invited all her principal composer friends each to make an arrangement of a work by J S Bach for inclusion in an album to be published by Oxford University Press. 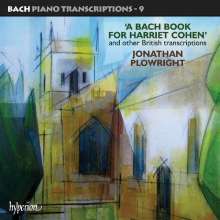 Published as A Bach Book for Harriet Cohen, it is recorded here for the first time by virtuoso pianist Jonathan Plowright. The disc is completed by eight other 20th-century British Bach transcriptions.